A disgraced mom left federal court Thursday, accused of taking part in a brazen scam to get her daughter into UCLA. Davina and Bruce Isackson, a California property developer, are the latest high-powered parents charged in the college admissions scandal. Their oldest daughter, Lauren, was admitted to UCLA in 2017 as a recruit on the school's elite soccer squad, the No. 2 team in the nation, officials say. UCLA's website lists Lauren as No. 41 and a midfielder, but she's not pictured in the team photo. Under her stats is a blank slate — because she apparently never played in a single game. 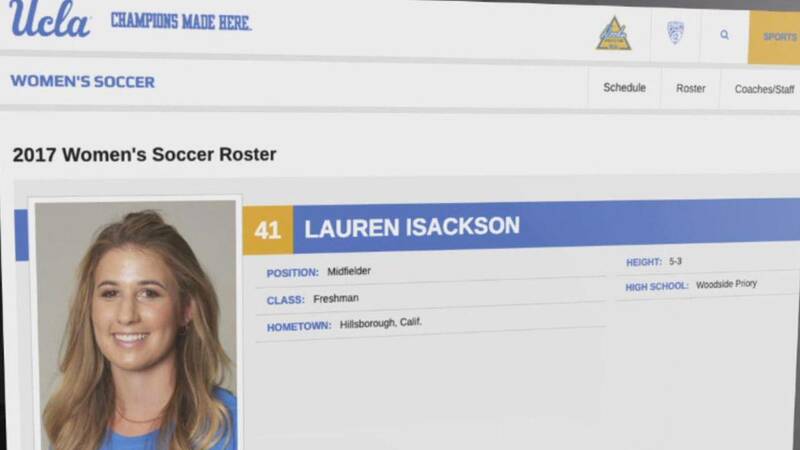 Her profile claims she was a team captain in high school for Woodside Soccer Club, but officials say they have no record of her ever playing there. According to authorities, it was all an elaborate hoax. They say Lauren’s parents paid William Singer, the ringleader of the college admissions scam, $250,000 in Facebook stock to get Lauren into UCLA. They also allegedly paid another $250,000 in bribes to get their younger daughter Audrey into USC as a fake rowing recruit, the same scheme actress Lori Loughlin and her husband, Mossimo Giannulli, allegedly used to get her two daughters into USC.